Wow! Thanks for the laugh. 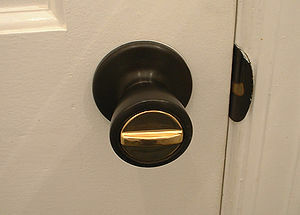 We had a similar problem at our house with the knobs that open from the inside like that. My wife locked herself out about 15 times our first year. Now she averages about once every two months. It’s easy to forget when the knob turns. It was bound to happen eventually. Now I have an extra key around my neck. In case you are wondering, I’m not singing an old Elvis song. There’s a key on a chain hanging from my neck. It turned out alright so I’m having fun wit it.